Padraig Amond is to leave Morecambe. Morecambe striker Padraig Amond has announced he is to leave the club. The striker is out of contract this summer and announced on Twitter on Tuesday afternoon that he is set for a move away from the Globe Arena. The 27-year-old Irishman arrived from Accrington in the summer of 2013 and was the Shrimps’ Golden Boot winner in his first season with the club. Amond has been in and out of the side this season but has still managed 10 goals in all competitions. Shrimps boss Jim Bentley was sitting down with his out of contract players on Tuesday with Amond’s the first confirmed departure. 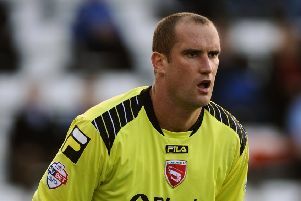 In a statement posted on his Twitter page he said: “I’d like to thank everybody at Morecambe Football Club for all they’ve done for me during the past two years. “The players are an unreal set of lads and I can’t speak any higher of them and I’ve made some friends for life. Bentley said: “Podge has been great for us and is popular with fans and players alike. “But it is that time of the year when you have to make really tough decisions and this is certainly one of them. The Shrimps have been linked with a move for former loanee Tom Barkhuizen who has been released by Blackpool and the wide man could take Amond’s spot in Bentley’s squad. Morecambe are well beaten – but staying up!